Howdy beautiful people! 😀 Welcome to our first Lifestyle post-2017! In the past, our Lifestyle posts have mostly revolved around food and recipes. Today we’ll try something a little different… And, I believe, the next best thing after food is certainly a DIY (Do It Yourself) project! 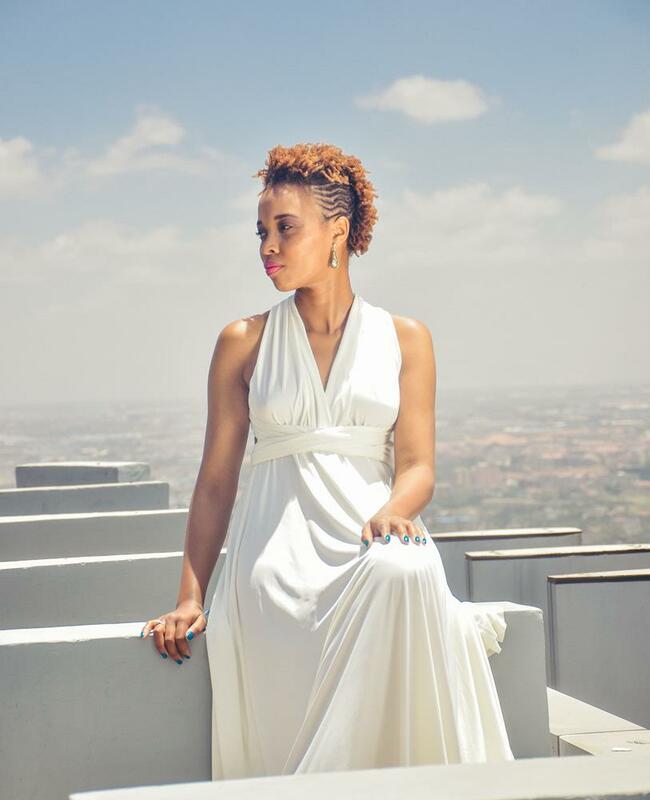 Lynn Wawira, is a good friend who owns and runs an Interior design company, Grey Silhouette. She is a true example of turning your interests into a career. Inspired to follow her passion, Lynn started off by taking Interior Design Classes while still in employment, back in 2011. Her entrepreneurial instincts, backed by good planning, later enabled her to completely venture out on her own. First and foremost, decide on the wall you want to paint over. As you choose the wall and paint colors, consider how well they will blend in with the rest of your home’s decor. We began by ‘priming’ the wall. Clean the wall with a cloth, to ensure that you are not working with an undercoat of dust or dirt. Leave it to dry for about 20 minutes. If your house was initially painted with a water-based paint, then you may want to apply a base coat with silk paint prior to this. Alternatively you can brush over the wall with a dry, soft brush to clear it of particles. This helps maintain consistency during application. Line the ground next to the wall with old newspapers to avoid messing the floor with paint. Begin by bordering the corners and edges with masking tape, to avoid the paint from spilling over. It also helps to define where your geometric shapes will begin and end. Be creative as you create your desired shapes. Try your best to create angular shapes, and maintain straight lines. Start from one side, and work your way to the other end of the wall. The risk of beginning at different ends is meeting in the middle where the shape (or lack thereof) doesn’t quite fit into the bigger picture. Press down on the tape to avoid bleeding of paint under the masking tape. As you lay the masking tape, ensure that the ends overlap on each another. This makes it easier to remove the tape, once the paint is dry. It also gives a good connection and continuity to the shapes you want to create. Such projects are more fun in groups, so we invited our sisters to come along…. Plus it gets the job done faster with more hands on board! It was interesting to learn that none of us had ever painted a wall before- all the more fun! To get started, mix paint with water in a 2:1 ratio, respectively, in a container. The magic trick here is the silk paint! It dries amazingly fast,with little to no paint fumes, which was rather impressive! One coat of silk paint, takes about 45 minutes to dry in good conditions like: a well-ventilated room and a sunny day. After lunch we took on painting the final and 3rd coat of paint. By this point, our paint job had started taking shape. Use a small brush to help fill in the edges and corners. If you can, do your painting on a sunny day and ensure that the room is well-ventilated as it helps the paint job dry much faster. Paint up to 3 coats of paint, as you gauge for yourself whether this is enough or more coats are needed. This is probably the most unnerving part. It is where the quality of your job actually gets tested! Allow the wall to dry sufficiently before you proceed to strip off the masking tape. You may each choose a beginning point, and remove the masking tape, paying attention to where the edges meet. If the base coat comes off with the tape, don’t panic! We dealt with such a situation, by painting over the small strips with the base coat, which luckily, happened to be available. Phew! Give the paint sufficient time to dry before removing the masking tape. You can use a much smaller brush to do the fill-ins with your base coat. We could hardly believe the end-product, and at such minimal cost and effort?! The entire room instantly took on a tasteful and lively quality, thanks to the beautiful wall patterns. Finally, it was only fitting to celebrate a job well done!! I promise you, we felt so proud of ourselves that day! You can always reach out to Grey Silhouette for a Professional Consult, and Interior Design services. Be sure to check out their Website for more information on Grey Silhouette, and their services! Many thanks to Grey Silhouette for making this Geometric Painting DIY project possible, and for the many tips on this! P.S.s. Go to my Instagram Page for details on how to WIN! I recall removing the first tape with fingers crossed…. And the exciment of the final product…. Wow! This painting turned out really nice. I love it! You really have some supportive buddies. I didn’t realize how easy geometric painting is until you explained the process. However from looking at it you can’t tell its that easy. Really cool. What an idea Man. Its terrific. Such a informative blog to change your home in to some exciting travel place. Love this idea of changing your home . Keep up the work. This is so insightful. I love it. This was such a productive experience. You have put everything in words, so beautiful. Looking forward to the next DIY project.